In the age of accountability in education, there are lots of factors that are out of our control. I am suggesting that we as teachers need to focus on the factors that we can control. More importantly, we need to focus on improving those factors that we can control. In my reflective practices in education, I have discovered that we cannot change the who, what, when, and where of education. We cannot change who we teach, what we teach, when we teach, or where we teach. In other words, we cannot change our students, our content, our schedule, nor the location of our schools. However, there are two important factors that we can change. We can change the why and how of education. Put simply, we have control over why we teach and how we teach. Every teacher has a story—a reason for teaching. These stories make us uniquely effective as teachers. We all have different reasons or motivation for teaching, but it is important to remember those stories, in order to influence the decisions that we make in our classrooms. In order to do what is best for students, I would argue that teachers must revisit why they are teaching in the first place. By asking this question, I believe that teachers will see the big picture of education, which will ultimately help them become better teachers. I personally teach in order to make a positive influence in the lives of my students and to help prepare them for their future as global citizens in the 21st century. To change why we teach is simply a matter of mindset. Dr. Carol Dweck, the author of Mindset, argues that "what people believe, shapes what people achieve." "For twenty years", she says, "My research has shown that the view you adopt for yourself profoundly affects the way you lead your life”. For example, Dweck has divided people into two categories—"fixed-mindset" and "growth-mindset". She has found that teachers with a "fixed-mindset" believe that their intelligence is “fixed” no matter what they do; whereas, teachers with a "growth-mindset" believe that their intelligence can “grow” with time and effort. In other words if teachers have a "growth-mindset" then they believe that their human qualities, such as intellectual skills, can be cultivated through effort. So, what does this mean? If teachers have a "growth-mindset" then their philosophy of education can ultimately be shaped from their learning experiences. Simply put, the reasons why we teach can change based on what we believe via learning, sharing, reflecting and growing with other educators. This is essentially something that we as teachers have control over. In other words, we have the ability to change our intrinsic motivation for coming to school each and every day. What I find interesting is the fact that our philosophy of education—the why—actually influences our instruction—the how. What's nice about instruction, is that we as teachers have autonomy over how we teach. Research will tell us that when people have voice and choice over their work, they are naturally more productive. Providing employees with autonomy, or independence and freedom over their work has proven to increase personal satisfaction and productivity. In his extensive research on motivation, Daniel Pink reveals, "The science shows that the secret to high performance isn't our biological drive or our reward-and-punishment drive, but our third drive—our deep-seated desire to direct our own lives, to extend and expand our abilities, and to make a contribution”. In other words, people are mostly motivated by their natural ambition to engage in meaningful work where they have control over how they complete their tasks. To change how we teach is simply a matter of instruction. We as teachers are empowered to teach in a manner to which we believe will yield the greatest learning experience for our students. And based on what we believe to be true about best-practice teaching will greatly impact our instructional strategies in the classroom. For example, some teachers prefer to integrate the arts into their instruction; whereas others prefer to integrate technology. Some teachers implement project-based learning; whereas others implement the "flipped classroom". Bottom line, the type of instruction that a teacher uses is completely up to her. And most of the time she will directly align her instruction to her pedagogical beliefs. Moving forward, I urge teachers to continue to research best practices, to explore their potential, to learn from each other, to share with each other, and to grow as professionals. Only then, will we be making the best decisions as to how we teach our students that will maximize their success in academics, and in life. 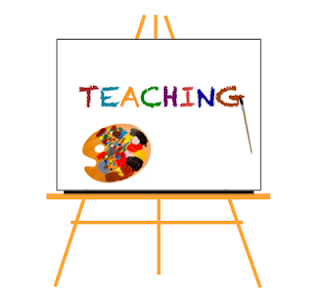 I truly believe that the art of teaching resides in the why and how of the teacher. Combining the reason why one teaches with how one teaches can truly produce a masterpiece in the classroom. And yet these masterpieces are uniquely different, but equally magnificent due to the power that each of us have to control why and how we teach. In conclusion, we each have the power and opportunity to create our own masterpiece. Thus, by continuing to learn and grow, we can discover new inspiration, new materials, new tools, and new techniques that will help us paint an authentic representation of what teaching looks like to each of us. Pink, D. H. (2009). Drive: the surprising truth about what motivates us. New York, NY: Riverhead Books.